Br. 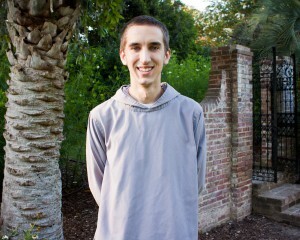 Anthony-Maria continued and told a few stories of guests and retreatants who had gotten in touch with the monastery to tell of how seemingly insignificant acts on his or someone else’s part had come to deeply affect their lives while so many miles away from the cloistered walls of Mepkin. And the more I think about it, the more I agree with the many guests who have been affected by this place and these people, and I’ve also come to agree with Br. Anthony’s awe. On the one hand, one’s acts in the monastery are menial and mundane, these are only ordinary people. Yet on the other hand, those same trivial acts can contain the deepest spiritual significance: a haircut, time in church, a conversation had, or a note shared. And I think that’s the point for these Trappists, if I may speak a few words on their behalf. The significance of Mepkin can be that simple and that complex at the same time. Sure, waking at 3 a.m. is never the most cheerful proposition, but done in community, you see what solidarity and a lifestyle of prayer look like in the most interdependent and beautifully human of ways. Being in the different context of the cloister helps you to see the ways we often miss that in the normal routine of life. Such a frenetic pace outside can work too well at insulating us from our very selves and the tangible silence of the cloister helps to remove those unnecessary distractions. Don’t get me wrong, that doesn’t mean it’s always easy all the time, but rather, the liberation of discipline aids in stripping us down to our rawness before the Divine. The reward is in that difficulty and hardship. The wonderful hospitality of Mepkin and their common life has not only taught me that, but it has been demonstrated before my very eyes as they have allowed me to partake of it for a time. Working, living, and praying alongside of the brothers while in the Monastic Guest Program has me proclaiming just how much they have come to mean to my spiritual life (and all my life for that matter) and it has me grateful that I can participate in their ministry in the Lowcountry of South Carolina at a place called Mepkin.